As this is the first surviving episode from the Second Doctor's era, The Underwater Menace gives us a glimpse into how Patrick Troughton was taking the role of The Doctor and putting his own light touch on it. His debut story, The Power of the Daleks, is sadly lost*, as is his follow-up story, the historic adventure The Highlanders. Out of his third story, this one, it is only Episode Three that is still with us. I find it curious that the first known surviving sighting of the Second Doctor has him dressed as a Gypsy, with the bandanna and playing his recorder. Somehow though, it seems fitting that one of our quirkier Doctors appears to us for the first time dressed in such a nutty garb. As for the story itself, it gets an A for inventiveness, even if the execution didn't quite go as well as it could have. The Doctor (Patrick Troughton) along with his Companions Polly (Anneke Wills), Ben (Michael Craze) and newest member Jamie McCrimmon (Fraser Hines) have arrived in the lost underwater city of Atlantis. Evil things, however, are afoot. A mad scientist named Zaroff (Joseph Furst) has persuaded the King to raise Atlantis from the sea. By doing that, he will cause Earth's destruction, and it's up to the Doctor to stop him. He is aided by a priest of the Atlantian goddess Ando named Ramo (Tom Watson). When we get to our episode, Zaroff is now completely mad with power. Ramo and the Doctor manage to escape execution thanks to Ben & Polly masquerading as Ando's voice. The Doctor comes up with a plan: get shipwrecked seamen Jacko (Paul Alin) and Sean (P.G. Stephens) to convince the Fish People, creatures who can live underwater, to go on strike. Without the Fish People collecting the food for the Atlantians, Zaroff loses credibility because the food quickly spoils, thus the Fish People must constantly be working. However, after kidnapping Zaroff he manages to escape, killing Ramo and taking Polly hostage. Zaroff manages to return to Court, but by now the King is alarmed that the Doctor was right. Zaroff then launches a coup d'etat, killing the King and declaring that nothing will stop him now. 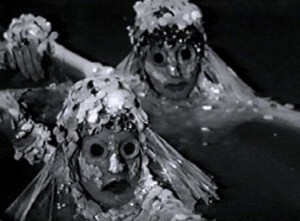 The Underwater Menace, from my understanding, isn't well-liked by Doctor Who fans, but the surviving episode to my mind was quite daring in many ways. First, director Julia Smith attempted to create as real an underwater world as budget and technology of 1967 would allow. Jack Robinson's sets, in particular Ando's Temple, along with Sandra Reid's costumes always indicated a fantastical world, as if everything required for life in Atlantis truly came from the sea. Now, I grant that some of the costumes, the Gypsy garb or some of the Atlantian children's wardrobe, was a touch exaggerated. However, to my mind it shows that there was a great deal of ambition behind The Underwater Menace. Also, it's interesting that Geoffrey Orme's script touched on the idea of unions being a good thing. This may be subtle, but how else to interpret that the success of the Doctor's plan turns on having the Fish People join in a union and go on strike against their cruel overlords, who keep them working constantly with no benefit to themselves? I can't say that this was Orme's specific intention, but one can easily draw that conclusion based on the story. Finally, let's move on to one of the best features of The Underwater Menace: the Fish People. Here, the costumes and sets did what they could to create this truly underwater world, and the effects of having the Fish People "float" underwater were on the whole rather impressive for 1967. True, you can see the wires holding the Fish People up, but for the most part, given that it was just the visuals and the music creating the mood of revolution in their sequences, on the whole I thought it was inventive and original for the series. Here, I have some criticism for The Underwater Menace: Dudley Simpson's incidental score. While the music for the temple scenes was alright, the music for the bazaar scene was rather loud and overbearing. Another point of contention is some of the acting. Furst's Zaroff, who reminded me of Paul Lukas both in look and accent, by the end of Episode Three was in full overacting mode: going wild in his madness and power-lust. 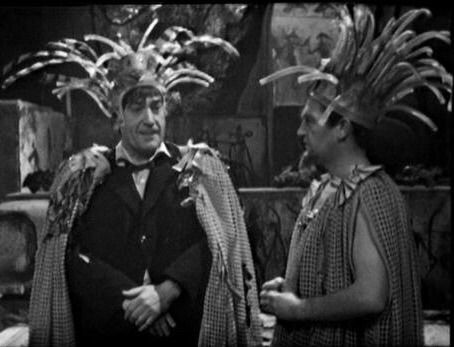 Conversely, the Atlantian High Priest Lolem (Peter Stephens) was one of the most fey characters in Doctor Who (certainly in Episode Three of The Underwater Menace). The word 'camp' does not do full justice to Stephens' performance. Finally, poor Polly again has to be relegated to being the 'damsel in distress', keeping the tradition of being the Who Girl who can do nothing but scream and scream again. Well, a sign of the times, I imagine. On the whole, I think The Underwater Menace has gotten a bad rap. Yes, some of the acting is overdone, and some of the comedy bits are a bit over-the-top: the Doctor as the King of the Gypsies, though what Gypsies are doing in Atlantis we don't know. However, The Underwater Menace shows the Doctor Who crew were trying to be inventive, get away from outer-space and history to try something unique and original. Some of the sets and costumes were among the most beautiful and creative in the Second Doctor's era. The best I can say is that I wanted to see what happens in the next episode, and that is a hallmark of a good story. I would like to see all of The Underwater Menace, and now with animation, we might get an even better story. In short, I give The Underwater Menace high marks for inventiveness and originality, if not execution. I think The Underwater Menace is a good story to soak in. *February 2018 Update: Since the original publishing of this review, The Power of The Daleks has been reconstructed using animation and the surviving audio tracks; it will be reviewed at a later date. Also, a second episode of The Underwater Menace has been discovered and the full story has been released on DVD, albeit with photographs to 'complete' the story. Another review will revisit The Underwater Menace, but for now, I'll leave the original review up.